As our own Jason Snell thoroughly explained last month, the iPad is an excellent device for reading comics. On Wednesday it got even better, as at long last DC Comics began digitally distributing its titles through Comixology and through its own app. As with Marvel’s own iPad app—itself built by Comixology—DC’s free app lets you browse series, purchase individual issues (which run between $1 and $3), and even opt for push notifications to alert you when new issues of a series are out. The app also provides a variety of reading experiences, including a Guided View that lets you jump from panel to panel. And, best of all, the DC app runs on the iPad, iPhone, and iPod touch and lets you read your comics on any or all of the devices. 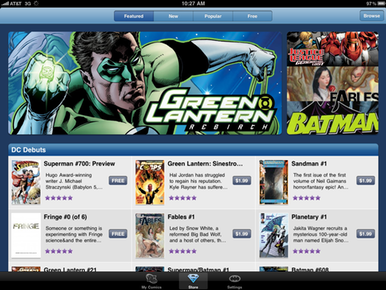 While Marvel’s app was available at the iPad’s launch, DC has been slow to adopt the newfangled digital distribution. Classic characters like Superman, Batman, and Green Lantern were consigned to a Phantom Zone of paper. But having now launched bravely into the digital age (perhaps a worthy successor to the modern age of comic books? ), DC appears to have jumped in head first. They’ve put a number of series online, not least of which appear to be the aforementioned bastions of superherodom. That’s hardly all, however, as there are also issues for more modern series likes The Losers, Fables, and Neil Gaiman’s Sandman. And the titles aren’t limited to Apple’s devices either—DC has also struck a deal with Sony to make its comics available on the PlayStation Network, for reading on the PSP. In distributing its wares through Comixology, DC joins not just Marvel but also other major rivals like Dark Horse Comics and Image Comics. With the four largest comic publishers in the U.S. now available via the iPad it seems pretty clear that the digital comics revolution is well underway. Excelsior!